The Ruggles Pass offers the convenience to play each time for just a $11 - $27 usage fee based on the time of year. Annual Pass prices listed above do not include 9.2 % sales tax and are subject to change without notice. Daily "Usage Fees" are tax inclusive. Complimentary use of approved personal carts or club owned carts during golf (no trail fees or cart fees). Pass holders may book tee times up to 14 days in advance for play Monday - Sunday. The Annual Pass program is effectively a program that allows for a frequent play at a discounted rate. As such, the Annual Pass Program is not a Membership Program in any way. The Annual Pass Program does not provide any ownership or control over the Club in any way. No additional rights, privileges, nor benefits should be inferred or expected except for those expressly stated herein. Annual Passes may not be sold or transferred. Players under the age of 12 must be accompanied by an adult. Practice shall be confined to the dedicated practice areas. Food & beverage on course premises must be purchased from Poston Butte Golf Club. Players must check-in with the golf shop prior to play. All play will begin on hole #1 and run consecutively, unless the golf shop grants permission to begin elsewhere. Tournament play or scheduled activities and events take precedence over regular play. Players agree to keep personal and club owned carts in the fairway or on the cart path at all times. Players also assume all risk of accident or damage to club owned carts and facilities. Players are responsible for any damages to his/her person or property and that of his/her family and guests and holds harmless Poston Butte Golf Club, it’s owners and employees for any claim, liability or demand of any kind. Payment may be in the form of cash, credit card or check. Make checks payable to Poston Butte Golf Club. The pass holders participating in the program will be registered in the Golf Shop. All pass holders must check in at the Golf Shop prior to using the facility. All other club policies and regulations apply. Annual Passes are nonrefundable, non-equity and nontransferable. The annual pass programs may be modified or discontinued at the discretion of management at any time. 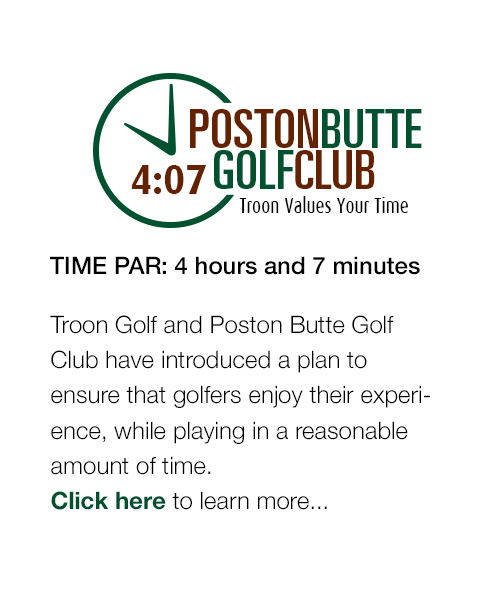 Poston Butte Golf Club reserves the right to offer discounted rates and golf specials throughout the year. Annual Pass fees collected will not be refunded at anytime through the year due to daily fee specials or other short-term discounted rate offers. All Annual Pass holders will be required to sign a document acknowledging the policies and rules.